The Rugged Razor takes many design features from its wildly successful big brother – the Rugged Surge – and incorporates them in a 6.4 inch, 15 ounce package. It runs on the same “Quick Detach Dual Taper Locking System” muzzle devices as the Surge for maximum accuracy and repeatability. It accepts the same interchangeable end caps for use on 5.56 as well as .30 caliber platforms. And best of all, it accomplishes truly amazing suppression levels for comparable silencers in its size/weight class. 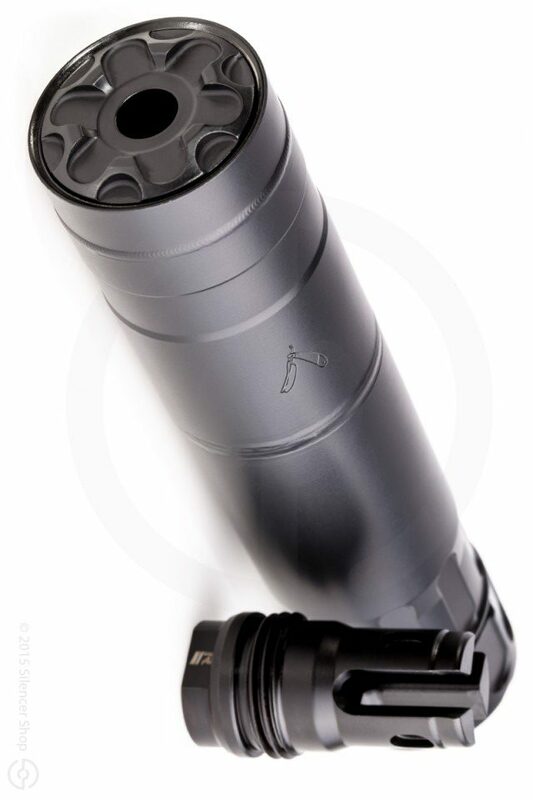 For those of you looking for a silencer that will suppress your host firearm to the point where shooting without hearing protection is still comfortable but is light enough that you don’t have a two pound weight on the end of your barrel, this is your guy! As this industry grows, we see trends immerge in both the market and in design. Some of these trends are superficial “marketing ploys” but every once in a while, someone hits the nail on the head. Rugged has achieved something that many other manufacturers have attempted this year. A six inch tube at fifteen ounces that is not compromised by lighter materials like Titanium or Aluminum. The core is still 100% Stellite and the rest of the silencer is 17-4 Stainless. This suppressor is still as durable as a full size silencer but half as cumbersome. The Razor is rated for any caliber up to .300 RUM and still retains the “Belt Fed Rated” accolade that Rugged has become known for. Don’t ask us how they did it, we are pretty well convinced that there is a wizard living in the blast chamber!